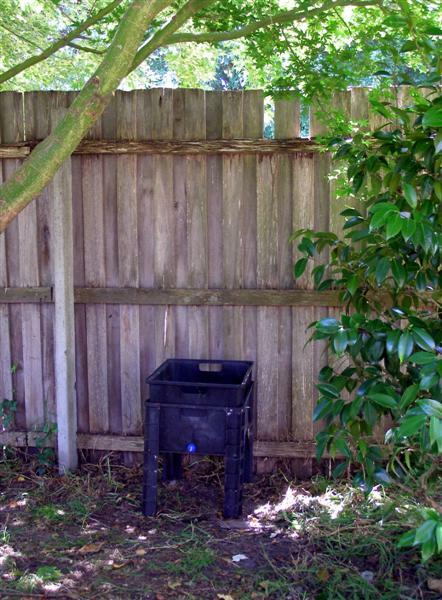 Yes I’m still here…but thinking of changing the name of my blog to ‘A Yearly Post from a Gippsland Garden’. It would be more appropriate perhaps. To be honest the joy of a trip overseas was followed up by a very melancholic few months. It took me by surprise, but thankfully I’m feeling bright eyed and bushy tailed again now 🙂 Thanks to those lovely bloggers who dropped me a line to say ‘Hi’…it might have taken until now to get a response out of me, but I appreciated it very much! Well, it’s heading into late spring in the Gippygarden and it has been a wet one! The pattern seems to be four days rain then a day or two of blazing sunshine, so you can imagine what the garden is like. The weeds have never been happier. Thankfully some of the intentional plantings are pretty happy about it too and the garden is lush if unruly. My personal bane the Harlequin Bug (dindymus versicolour) is also pretty chuffed about all the lush new growth. So my post work relaxation routine seems to consist of carrying around a bucket of soapy water and picking off the bugs to drop into it. 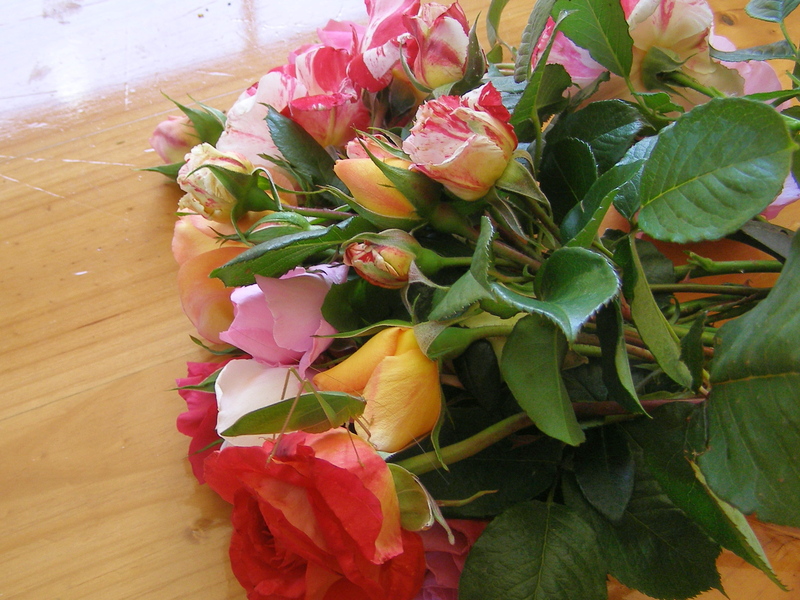 I can be heard muttering darkly to them as I find them clustered on my roses. Yes it’s a bit gruesome, but it is the only thing that seems effective without using toxic sprays that will equally hurt the good bugs (the soapy water that is, not the muttering). It is requiring quite a bit of vigilance. Every day there are plenty of new bugs and my ultimate aim is to keep the population down before my tomatoes grow and produce ripe fruit. 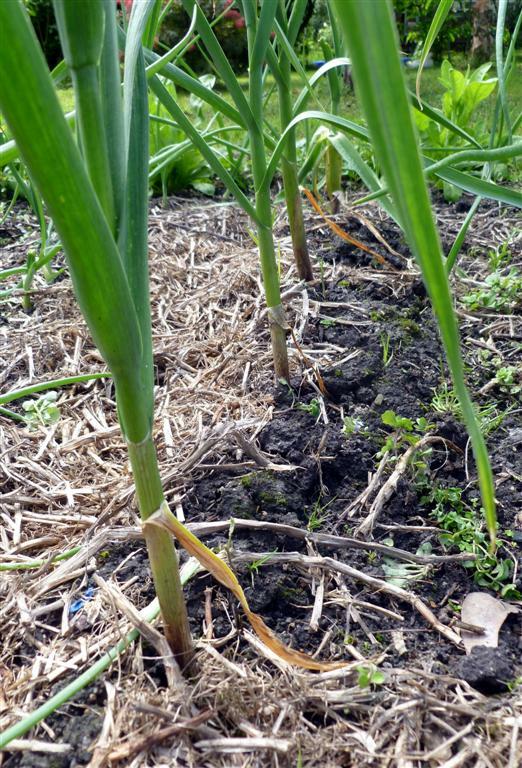 In other garden news the garlic I planted in the garden bed has stunned me by growing better than what I potted up, which is a surprise, particularly when it has been so wet. None of it is growing fantastically, but it is all still alive and growing reasonably well. 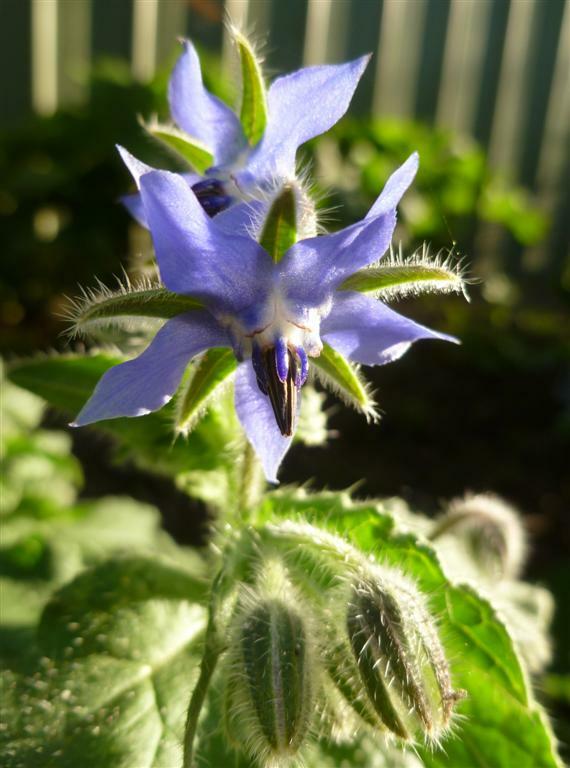 Bees love Borage and so do I. Who could resist that colour?! Not a good perspective shot, but this is a tiny native bee. 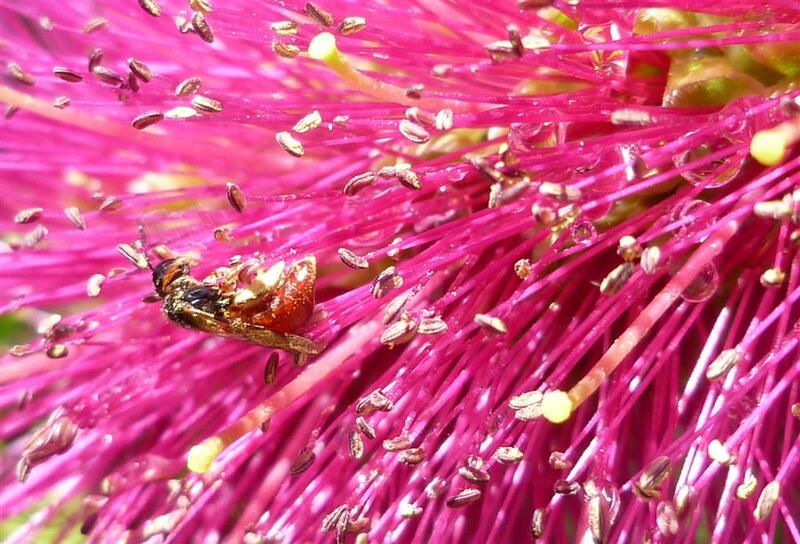 It is about a third of the size of a honey bee and is clearly enjoying our callistemon! From that header you might think I’m about to to gloat…or even complain about a glut of produce. I have (quite inevitably really) learnt the hard way what happens when you get ahead of yourself and your gardening experience. Too many tomato plants + not enough experience = not so many lovely ripe tomatoes! Don’t get me wrong, we have not been bereft of tomatoes. 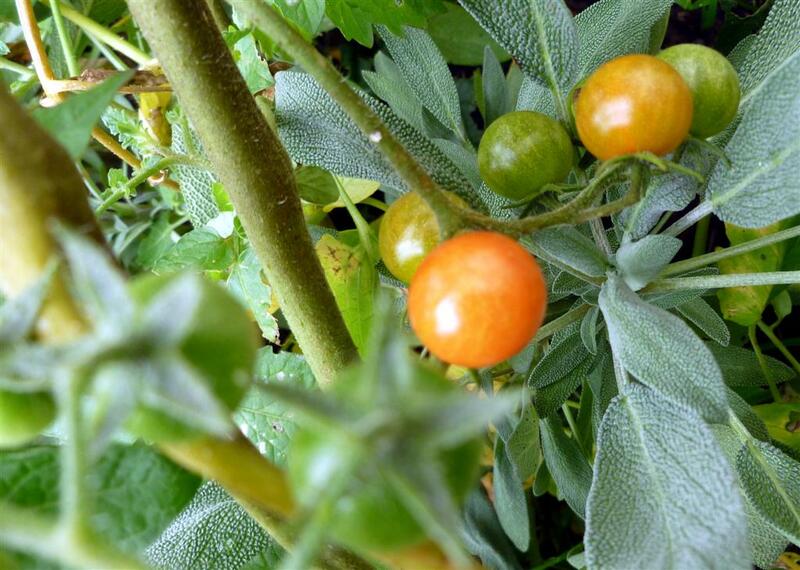 In fact, the cherry tomatoes have been keeping us in good supply from quite early in Summer and are still going strong well into Autumn. A truss of tiny 'Wild Sweeties' which are each about the size of my little fingertip. 1. I never did get just how big those tiny little seedlings were going to grow. Hence the stakes I used were too small, bendy and weak for the task. Naturally I followed up my folly by trying to re-stake the plants and killed a couple by stabbing them through the heart. OK, roots then. 2. I planted too many tomatoes too close together. Add a bit of warmth, a bit of damp and…you get the picture…another couple bite the dust. Just last January I was wittering on about how I have Harlequin bugs (Dindymus Versicolour) in my garden but that they don’t seem to do much damage. How wrong could I be?! I just hadn’t found their favourite snack yet! At first I worried about them spoiling the fruit (which they do with joyful abondon) but it took a while to twig that they were sucking the life out of the stems too. Good grief, what little horrors they are! If I’m honest my gardening hygiene wasn’t what it should be either. I wasn’t quick enough to monitor, pick off and dispose of spoiled fruit, so this did give the bugs a foothold that I’ve been sorely regretting. I’ve picked up my game and this has helped, but now the season is coming to an end so I’m left with looking to improve my skills for next year. 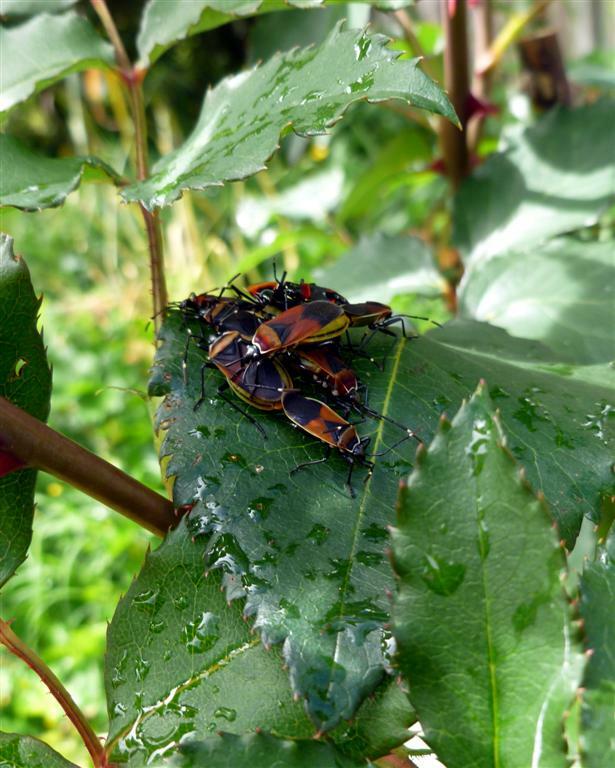 I have also been trying to research organic ways to control the Harlequin bugs with little avail. Like many shield and stink bugs they respond to a passing shadow by scampering off to hide, so they are hard to get hold of for a good squishing. Home made White Oil seems to have helped a bit, it’s not great on the tomatoes in sunny warm weather. So, if anyone has any good organic ideas that aren’t going to hurt the bees and the butterflies I would love to hear them! Some happy Wild Sweeties...the one tomato I placed in the herb garden is doing just fine...I think there might be a clue there! The good news is that the aphids are all but gone. The little wasps are still busy doing their gruesome alien emergence thing, but that’s fine with me because it works. No chemicals and (very nearly) no aphids. Lovely. The bad news is that no flotilla of ladybugs appeared. I’m starting to wonder if the little wasps are too much competition for them. Something I read (can’t remember where now) did say that the parasitic wasps were a more effective biological control for aphids than ladybugs or lacewings. I wonder if being out-competed is the real cause for the loss of my ladybug population. I’m going to have to look into that, but today I’ve been on an identity search for prime rose chewing suspect number one. Did you see her perched there amongst the roses? 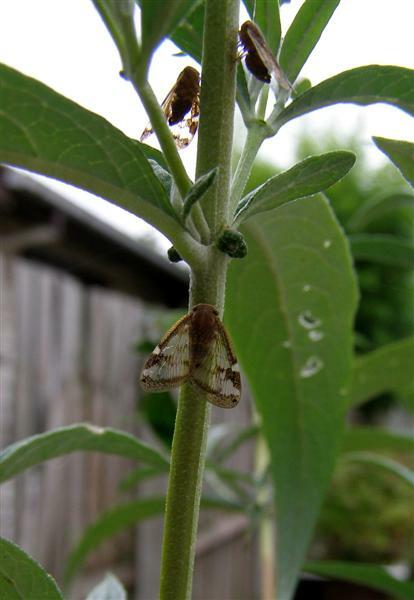 Because I work hard (stand back and let nature take it’s course) to avoid using insecticides on my plants, the occasional bug does come along and do some damage. It’s never as bad as you might think and I only loose the occasional bloom. I think that is a small price to pay to have the bees, the butterflies and the creepy little parasitic wasps visit. But I think this critter has been taking big mouthfuls out of some of my blooms and I’ve been trying to figure out who she is since January. 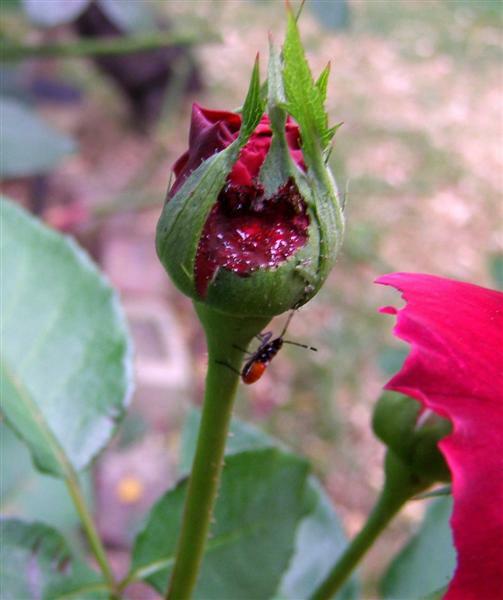 In January I was still considering blaming the Harlequin bugs (Dindymous Versicolour) for my rose bud damage, but my suspicion was aroused when the creature below was found near the scene of the crime. I’ve since found it loitering nearby on two or three more occasions, so it has become prime suspect number one. It has taken me ages to figure out what it is exactly as it looked to me like a cross between a grasshopper and a leafhopper. 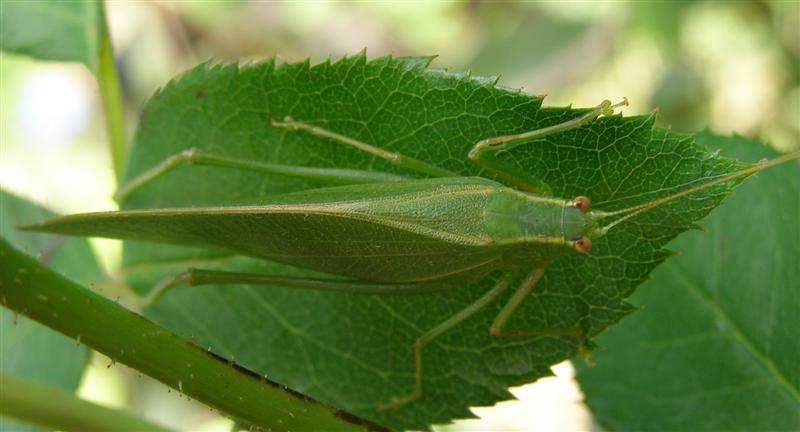 Turns out grasshopper was closest to the mark and some of you probably recognised it instantly as a Katydid, who has both British and Northern American cousins. 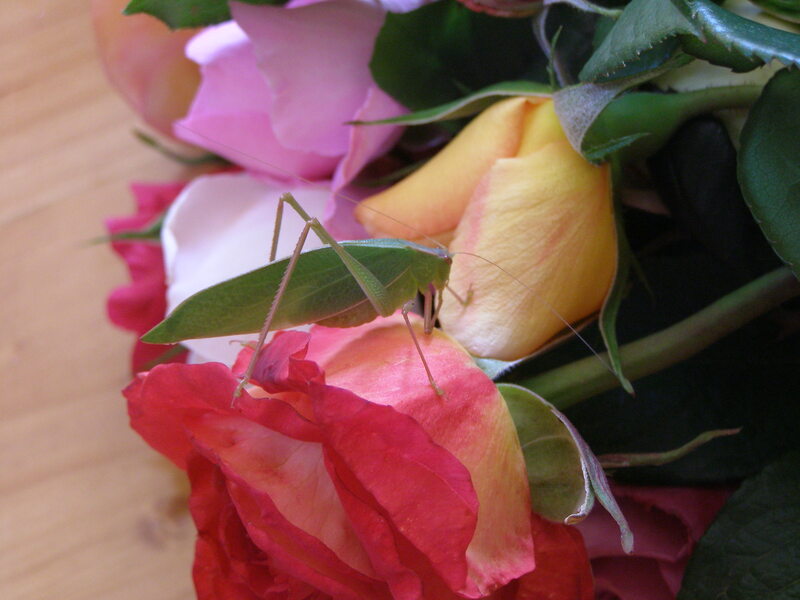 I think this one is an Inland Katydid (Caedicia simplex). Turns out they like to munch on flower buds. Hmm. 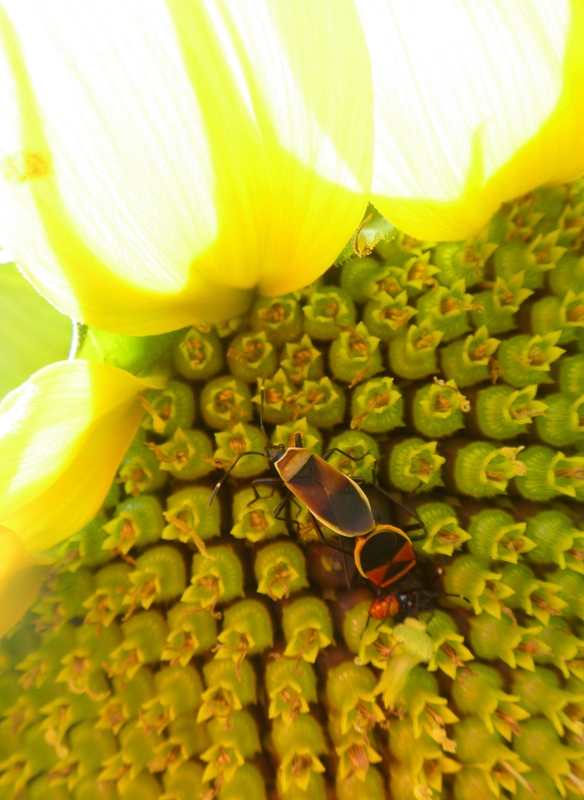 Is the Harlequin Bug really the garden thug I should be worried about? I’ve been spending far too much time with the bugs. I was caught yesterday standing in the middle of a garden bed apparently staring, with great absorption, at nothing at all. It was in fact a bug. I was watching its habits. It was very interesting. 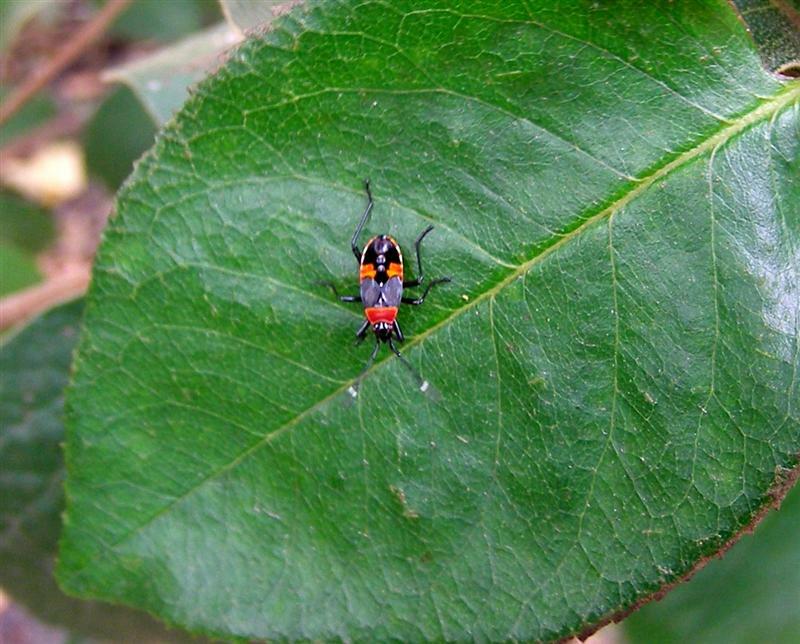 I think I’ve confirmed that the shiny little red critters and multicoloured adult bug of my last post are Harlequin Bugs (Dindymus versicolour) which are a species of ‘true bugs’ related to Dysdercus cingulatus – the Cotton Stainer Bug and a member of the Pyrrhocoridae family. Morwell National Park (which is not too far from where I live) has a great database of all the fauna and flora in the park and you can find a photo of the adult and young Dindymus versicolour bugs here. These photos confirmed that both the critters I was looking at were indeed the same bug. a) They like to run around a lot. 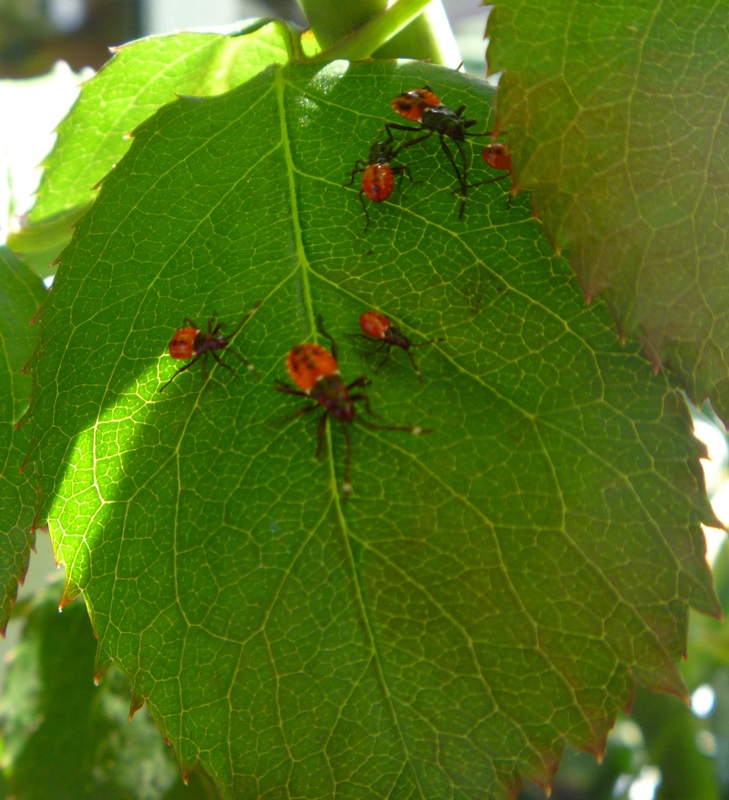 b) They cluster together under leaves, adults seeming to babysit young. c) They do a strange little ‘antenna dance’ when they meet each other doing their favourite activity, which is running around a lot. d) They didn’t eat the first rose bud. e) Nothing seems to be eating them. Dindymus versicolour at the scene of the crime on a rose bud, but is he the true culprit, or has he been framed? The real problem? I think it's a member of the leafhopper family and not sure if it's friend or foe. 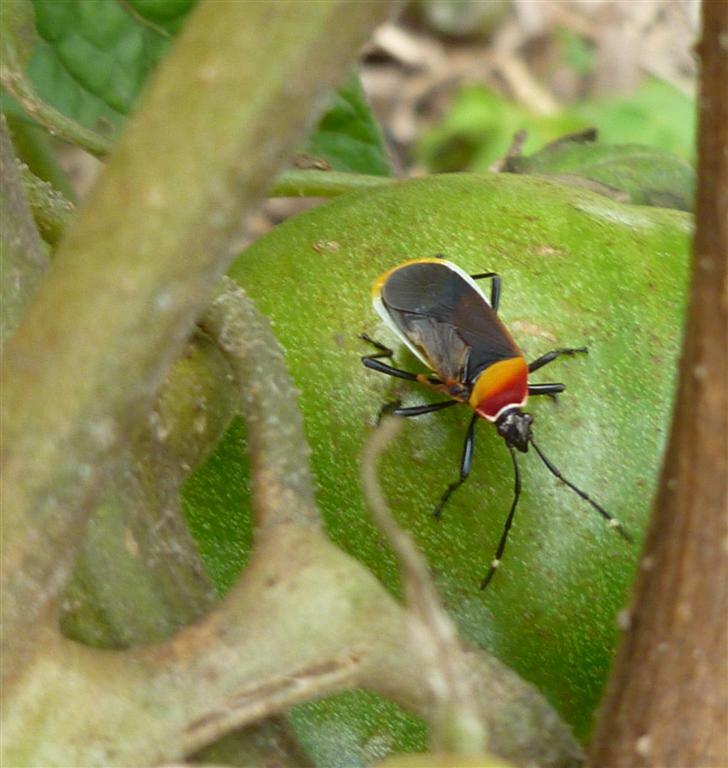 In a nutshell it seems that Harlequin Bugs are a pest for commercial crops and the home garden. More bad news is that predators generally don’t find them to be a tasty snack as they smell and taste bad. However some sources suggest that they generally don’t do enough damage to be concerned about unless they appear in seriously large numbers, so there’s no need to panic and reach for the toxic spray. 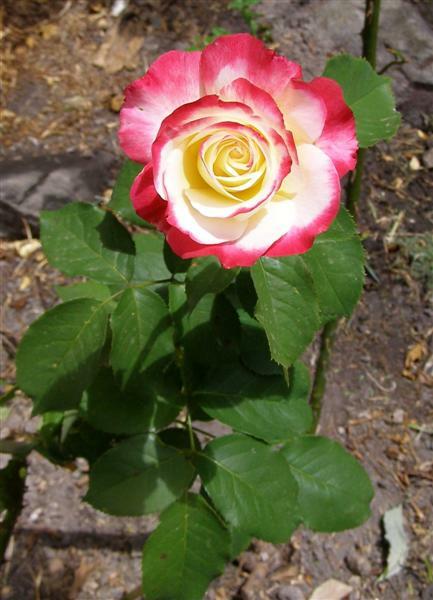 I do see the occasional badly damaged rose bud in my garden, but still have plenty of unharmed blooms to enjoy, and I haven’t yet seen with my own eyes who is actually doing the damage. So I’m not risking killing hover flies and ladybugs to reduce the number of Harlequin bugs. The Harlequin Bugs do have cousins in many parts of the world. 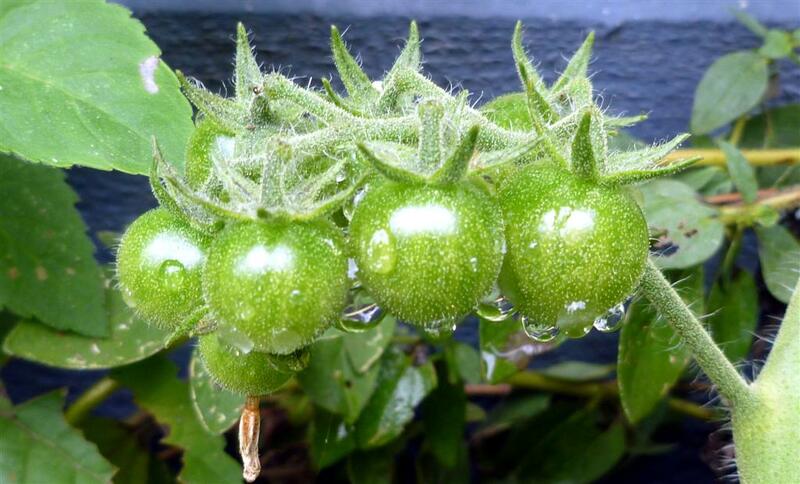 I mentioned Bangchik’s photo of red bugs on a Roselle from his ‘My Little Vegetable Garden’ Blog in Malaysia last time. Diana from Elephant’s Eye in South Africa also mentioned in the comments that she had a post recently on Shield bugs. Have a look at her amazing photos at Elephant’s Eye . Autumn Belle who keeps the wonderful ‘My Nice Garden’ blog mentioned seeing them in her garden in Malaysia too. 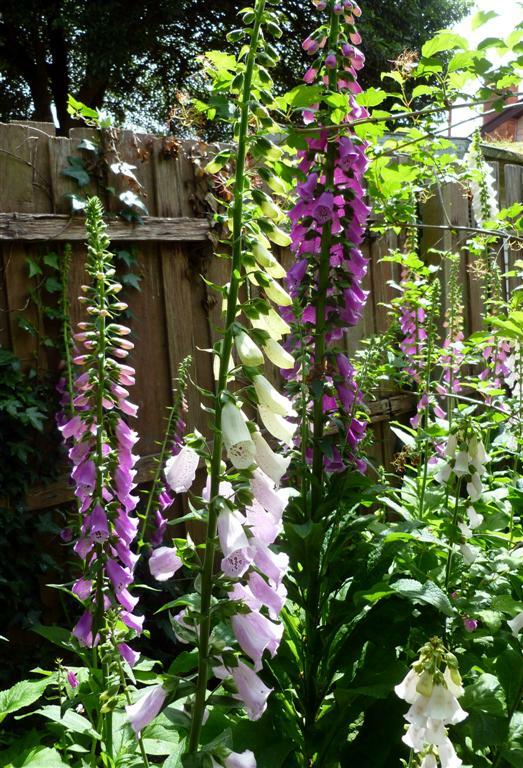 I’d be very interested to know if you have them in your garden and if you have a photo to share. I’d be particularly interested to know if you have caught them in the act of eating one of your plants! *I am pleased to announce that I now know my Brachyscombes from my Bracheantha. I think. When a ladybird isn’t a ladybird at all! 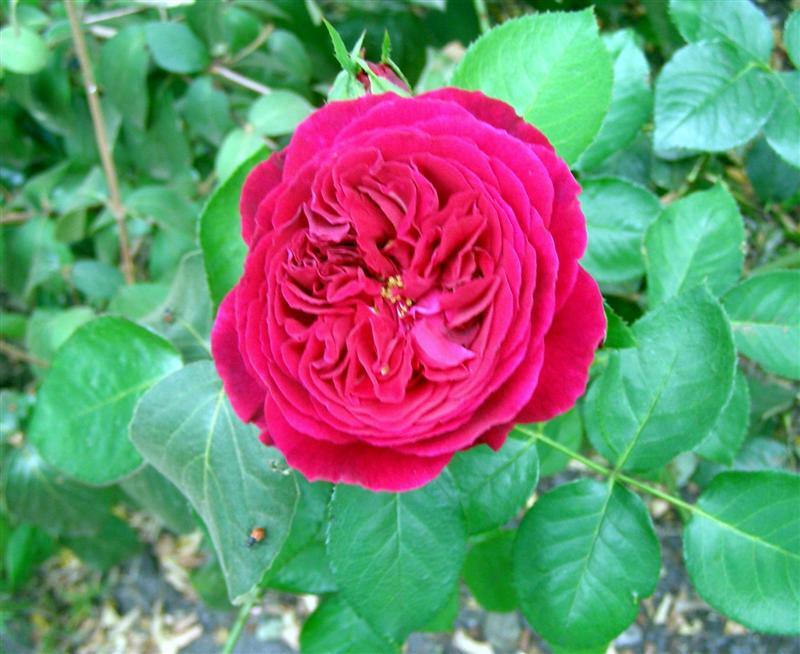 I have been bemoaning the absence of ladybirds in my garden this year, so you will understand how excited I was when last night I spotted a flash of red on one of my roses. Unfortunately, when I stopped for a proper look, I saw a lot more little red bugs and it was clear that although these were indeed red with black spots, these were no ladybirds. They are about the size of ladybirds, but they were looking and behaving suspiciously like something else. Sure enough when I looked closer still I noticed that an adult Harlequin bug was amongst the little critters. Some comparisons between body shape and markings could be made. The little critters have red boddies and vague black markings on their bodies unlike the distinctly pattered adult Harlequin, but share the same body shape as the adult and a little white dot half way up the antenna (which you can’t really see in the photos, sorry). 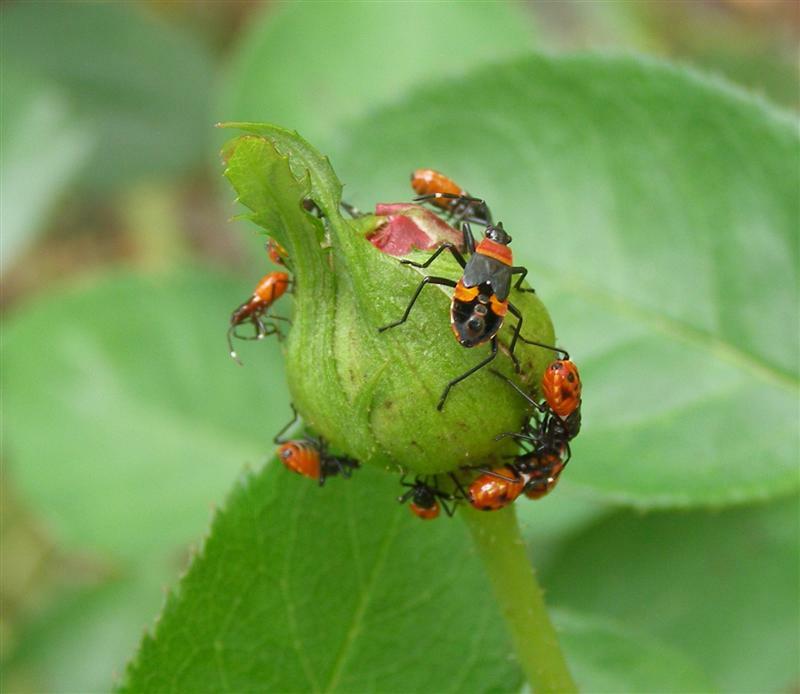 I blame Harlequin bugs for some badly damaged rose buds in my garden, but in fairness I’ve never spotted them doing the damage. The bud they are clustered on in the photo looks none the worse for wear for them being there, but we shall see! The large bug is certainly a harlequin bug! Question one – Can I find any more evidence to confirm if these little beasts really are young Harlequin bugs? 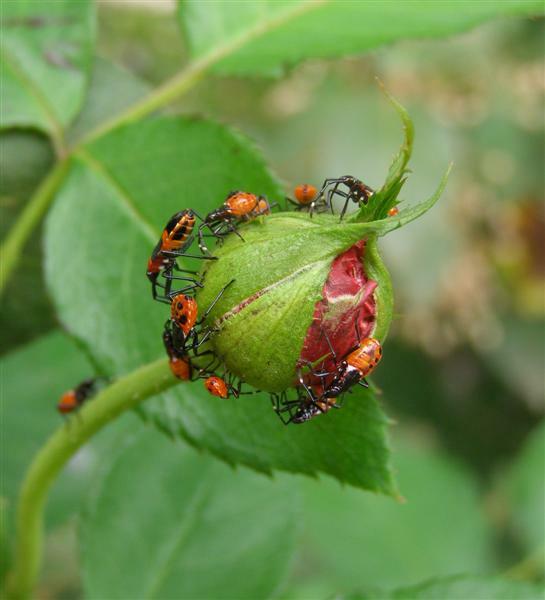 Question two – Will they chew through my rose bud and prove they deserve my wrath? Question three – Will a natural predator turn up and deal with them? If so who and how? I’ll update as investigations develop! Part one – setting up the farm & moving the worms in. The remaining parts of the worm farm. Enough to be going on with I think! A few years ago we had a worm farm that produced beautiful ‘worm tea’ and vermacasts for the garden. Worm by-products are a fantastic rich fertiliser that doesn’t burn plants. I can’t remember why we stopped using it, but for some reason the worms were set free and the farm was packed away. 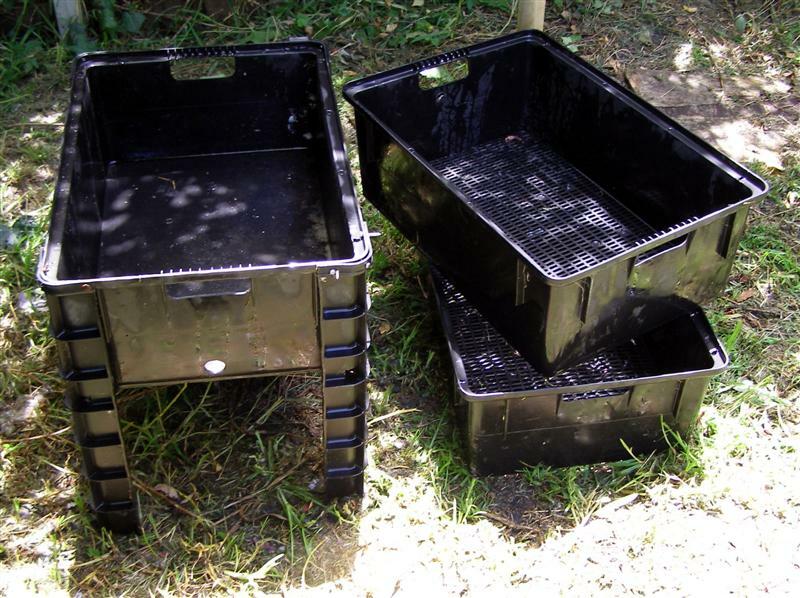 While pottering around recently I found the old plastic worm farm and have decided to give it a new lease on life. Sadly parts of it seem to have been ‘re-purposed’ or just plain lost over the years and it’s been left without it’s tap or the lid. I had a scrounge around and came up with some things I hoped I could use to get it up and running again. The worm farm needs to be in a fairly shady location. Shelter from frost is important too. 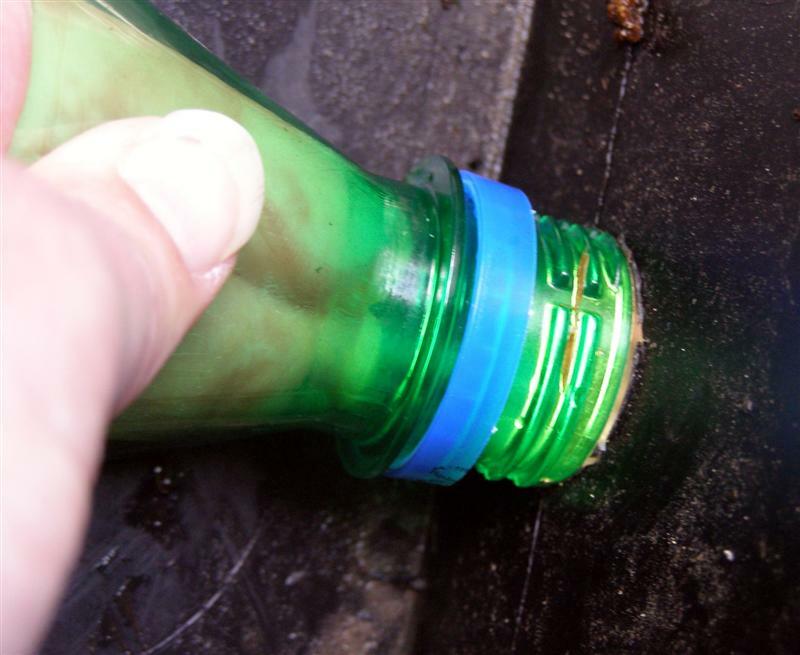 The lemonade bottle top was just a tiny bit too big for the hole in the tub, but a very sharp knife helped widen it just enough. It fits pretty well, but not 100% snug, so I’ll keep an eye on how much leakage there is and put some silicone sealant around the hole if need be. The old tap was narrower and used to get clogged up a bit so maybe this will flow better, if it lasts! Once the tap issue was sorted, it was just a matter of setting up the worms new home. As my daughter is currently keen on being an entomologist when she grows up I was lucky to have a willing helper. Half a dozen pages of damp newspaper (worms don’t like anything dry!) went in to line the first ‘residential’ tray that was nestled above the drainage tray. Here is the Box O’ worms! I bought them live from a hardware shop which my daughter found to be a very strange idea indeed. Compost worms are different varieties from standard earthworms which we are also lucky to have in the garden. I’ve read recommendations that worm farms the size we are using should be started with 500 worms and others that recommend at least 1000 or even 2000. We’ve just got 500 and the hope that in a few weeks they will be happy enough in their new home to make more worms! 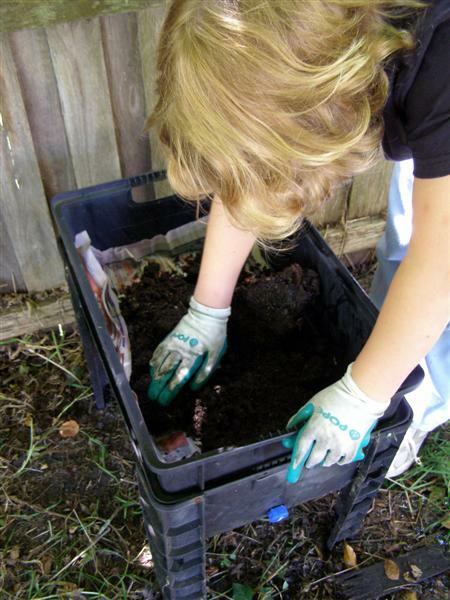 Below my daughter is helping spread the worm mixture gently across the tray. They go in complete with the organic matter they were boxed with to help them settle into their new home and have somewhere to hide. Worms like hiding so much we thought our box of worms had no worms at first! If you look really closely you will see that there is more than one worm! 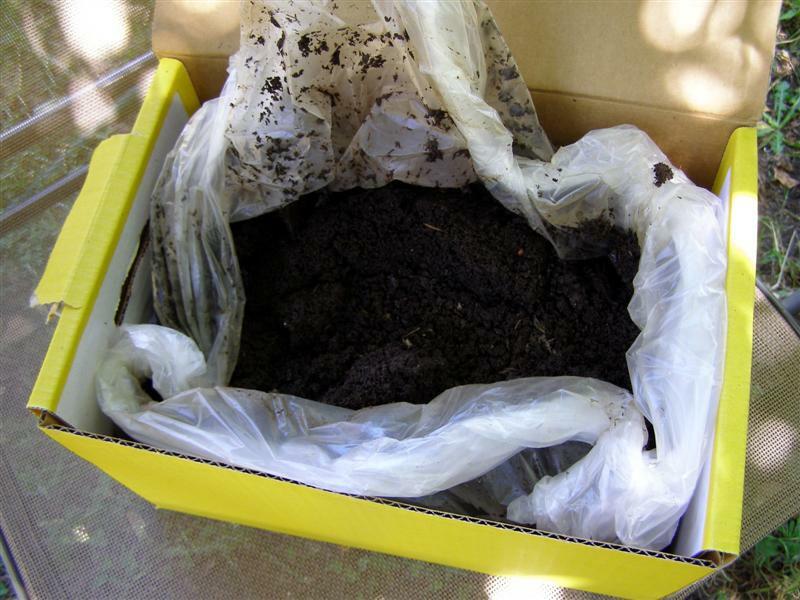 Every bit of information on worm farms seems to recommend only giving them a little food at first, but they don’t tend to quantify what a ‘little’ is, so we guesstimated about a cup worth of compostables, mainly old potato peelings and banana skins. The Gardening Australia fact sheet on worm farms recommended banana skins, so hopefully we’ll be hearing contented munching noises soon! At this stage the worms should not need feeding again for a least a week as they will be busy settling in. Definitely don’t feed worms meat or meat tainted scraps and limit use of onion or citrus in a worm farm. 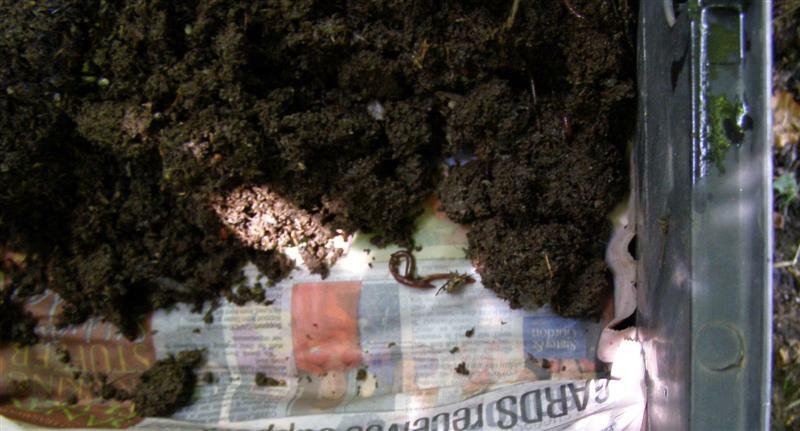 Last of all we added a blanket for the worms – another layer of damp newspaper. The whole farm can be covered with wet hessian or carpet if it’s getting really hot. I checked our worms a few hours after setting them up and already they are moving about the new food scraps, so I’m guessing they are hungry! We will be checking on them each day to see how they are going and to make sure that their home does not dry out. I’m not sure what to do for a more long term solution for the missing lid, but my temporary solution was to out an old sign across the top and weigh it down with the spare worm farm tray. I’ll scrounge up something more permanent soon. I found out what these pesky little critters were. 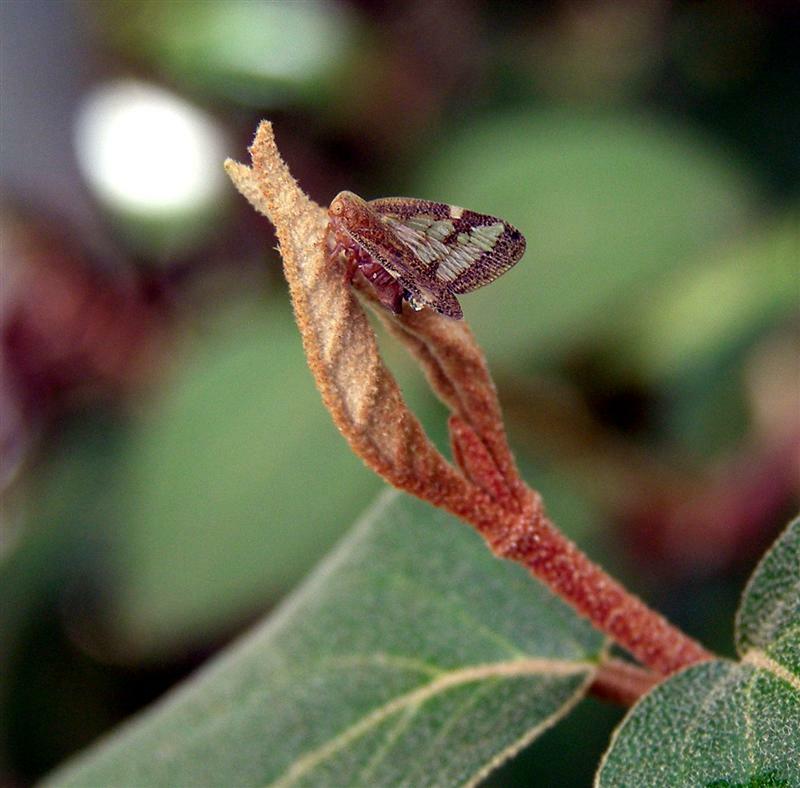 They are a native ‘true bug’ Scolypopa australis with the common name ‘Passionvine Hopper’ . They love sucking the sap from creepers and other plants (like buddleia) that produce nice juicy new shoots. Interestingly when I trimmed out the canopy of the buddleia noticed a lot less of these and some contented looking Red Wattle Birds. You have to love natural biological controls!